As the number of foreigners residing in Korea has been increasing, it is not difficult to find international people around us all over the country. Gwangju is no exception. The Resident Registration Population Statistics 2017 released by the Gwangju City Hall shows that 21,279 foreigners have been registered as residents in the city as of December 31, and they have doubled over the past 10 years. Our society going global is an irresistible trend. Local people have to learn how to live happily together with international people from different countries all over the world. In this situation, international volunteering at domestic organizations is a great way to develop cultural awareness and diversity and contribute to our community by assisting foreigners residing in our region. 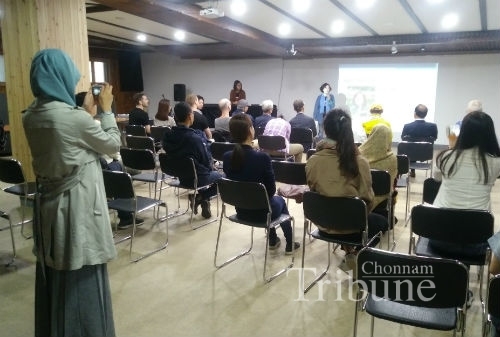 The Chonnam Tribune introduces some volunteer programs so that students can contribute their time and talents for foreigners, by sharing the stories of students taking part in such volunteer activities in our local community. There are many volunteer programs aiming at contributing to a global experience of mutual understanding through cultural exchanges between Korean students and foreigners residing in Gwangju or Jeonnam areas. Representative organizations to offer such programs are the Gwangju International Center (GIC) and the Korean National Federation of UNESCO Clubs and Associations (KNFUCA) in Gwangju. Kim Seong-ah, the section chief of KNFUCA, said that they are looking for foreign and Korean volunteers who are proud of their own countries and cultures and very responsible for their roles. 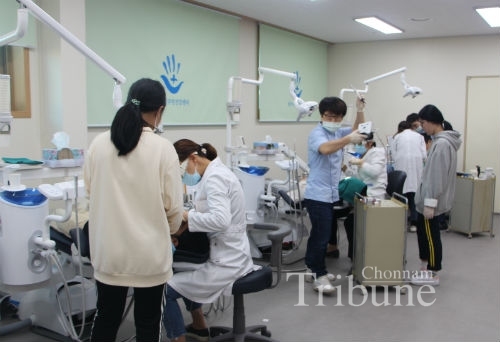 Some students of Chonnam National University (CNU) are participating in volunteering activities of Cross-Cultural Awareness Programs (CCAP) of the KNJUCA. Tharanga Dilruk Ranasinghe (Ph.D. Student, Dept. of Library and Information Science) who has experienced this activity as a Cultural Exchange Volunteer (CEVs) said, “I wanted to find out the opportunities available for a foreigner like me to join some cultural exchange programs. The CCAP gave me the courage and opportunity to introduce my country’s culture to the young generation of Korea. I hope many good volunteers apply for it.” Any international student can be a CEV who introduces his or her own country's culture in the classrooms of elementary, middle or high schools. Korean students can also join the program as Korean Interpretation Volunteers (KIVs). Lee Yu-kyoung (Junior, Dept. of Library and Information Science) said, “I applied for it since I like children and have an interest in educational volunteer activities. I experienced other countries’ cultures and want to recommend it for people who like students and want to learn about other cultures.” KIVs help their CEVs to prepare teaching materials and translate CEV′s lectures and play a very responsible role to make the class interesting and successful. Students who have an interest in this program can apply for it through the UNESCO website in February and August. The activity period is three months from April to June or from September to November. Another program is GIC Talk to offer cultural understanding for Koreans and foreigners. The GIC Talk is a weekly English talk program for intercultural communication and understanding between local Korean citizens and international residents. Every Saturday, participants talk about various topics including world cultures, social issues, and the speakers’ experience. Kim Hae-in (Freshman, Dept. of English Language and Literature) who has participated in the program as a volunteer said, “My high school teacher recommended this activity to me. Therefore I applied for it. I usually take pictures and videos during the GIC Talk. I also write a review of the program in English and manage the Facebook page. I like this program since I can speak and communicate in English with various awesome international people.” Anyone can apply for it through GIC’s social network service or website. The GIC recruits volunteers only in December and June. Students have volunteer opportunities to help international people’s daily lives by engaging in a Korean-English language exchange program of the GIC. It has a variety of activities including many topics aimed at achieving intercultural communication and understanding between Koreans and foreigners in this program. Kim Hyun-ji (Senior, Dept. of Chemical Engineering) said, “I knew about this program while I was participating in a GIC Tour last year. I like it since I can learn English and get along with various international friends. I want to recommend it for people.” It is held every Wednesday evening and anyone can do the voluntary service in this program. Volunteers should choose topics and make quizzes for every meeting. GIC Voluntour (Volunteer + Tour), cooperated by the GIC and the Mt. Mudeung National Park Office, is a program that allows local and foreign residents to interact with each other through hiking and volunteer activities. Volunteers climb to designated courses after campaign activities, such as trash removal, non-cooking, a smoking campaign, cleanup activities and the park purification activities including alien plant removal, transplanting of native species and garbage collection. They can get information about monthly activities and courses by reading promotional materials. This program would be good for people to climb Mt. Mudeung every month, serve, and make memories with local and international residents together. The volunteers at the GIHC tried to do their best for providing health care and their love toward foreigners, most of whom have used this care service expressed great gratitude toward the center and the volunteers. Suh Se-ryung (Second Year, Bachelor's Degree and Doctor of Dental Surgery, School of Dentistry), who is the president of “Sauiyeon” which is a medical research club in the School of Dentistry and has volunteered at the center, talked about her experience as a volunteer at the center. “I was interested in voluntary services for immigrant workers. I could participate in this activity by joining the club that is aimed at supporting foreign workers. As the GIHC has all the medical supplies, we only need to visit and offer medical and dental care services in a good environment without any difficulty in volunteering. It is a little bit difficult to do the healthcare service for immigrant workers due to a communication problem, but interpreter volunteers help medical staff and patients very well.” The foreigners have tried to reward the service in several ways. Therefore, the center’s volunteers can improve their medical services to help foreigners settle down in our community well. Through experiences of these kind of activities, student volunteers can use their own major-related knowledge and skills. As the world becomes more globalized, we are facing a growing need to understand other countries’ culture and learn how to live well together with international people in our local community. As mentioned above, some students have been taking part in diverse volunteer programs operated by several organizations in Gwangju, developing a global mindset and contributing to our society through regular volunteer activities that help international people. They are wonderful volunteers trying very hard to live a harmonious life with international people and also are good at making good relationships with other people. Unlike other types of volunteer activities, this international volunteering at domestic organizations is very helpful for both student volunteers and beneficiaries of volunteering in a global society since the beneficiaries who are foreigners in Gwangju could get help to live well in the city and feel the warm love from the volunteers. The volunteers could make themselves better people suitable for a globalized society through international volunteer activities. If someone joins them, he or she would learn many valuable things and also would be a nice and warm person needed for our society in the age of globalization. This article is expected to motivate its readers to build a global mindset and enhance their global competitiveness by participating in international volunteer activities in the near future.